Excerpts from the talk given by John Parker at the 2014 Workers World Party National Conference in New York City. This $15-an-hour ballot initiative in Los Angeles is about changing the relationship between capital and labor by establishing powerful workers’ assemblies throughout the country. In Los Angeles, it could strongly continue to empower low-wage workers and their fight for $15 and a union. This ballot initiative calls for the right of grassroots community organizations through the LA Workers’ Assembly to require that McDonalds, Walmart and other large employers allow educational forums on site. We see the potential for the unions to grow. The fight to stop the super exploitation of immigrant labor would also be strengthened and highlighted since this ballot classifies any immigrant detainees as employees eligible for the $15 minimum wage. Today they are forced to work for a dollar per day or less. The minimum wage increase put on the ballot in Oakland in November passed between 55 to 81 percent where they now will have a $15 minimum wage by 2018. Although that’s still too little, the time is now to ride the building progressive wave built by low-wage workers. The time is now to show the utmost solidarity in their demands for $15 and a union, and it shows that if this LA initiative gets on the ballot, it will also win. Although we have the endorsement of the United Teachers of Los Angeles and one of the largest church coalitions, Interfaith Communities United for Justice and Peace, the County Federation of Labor and other unions have a strategy to win a higher minimum wage which is years in the making and depends on kindred relationships with political forces, the Democratic Party and negotiations with businesses — all behind closed doors and excluding the forces in our class — they are not organizing or not in unions. Lenin warned the trade union movement about the dangers of isolating themselves and losing their potential power by not including the forces outside of the union movement: those people’s movements against police brutality or poverty or housing or equality. It’s that “behind-closed-doors” strategy that’s discouraging union rank-and-file members from what they would naturally be doing: jumping at the opportunity to direct union dues and union power to ensure the 62,000 signatures necessary to get this on the ballot in May. After all, it was the announcement of our official ballot that spooked the mayor into proposing $13.25 by 2017, and they know that. But we’re going to keep on reaching out to the rank and file. We’re learning how to reach into our local communities in a deeper way to make this ballot initiative a household word. It may seem odd for us to fight so hard using the tool of bourgeois elections, but it’s really a crack in their system we’re exploiting, that we’re prying open even further to encourage the audacity to believe that workers have the right to determine the wages they make and the amount of surplus value they take. Why leave the minimum wage up to politicians and their corporate sponsors? We’re prying that crack open even further to encourage broader solidarity that taps into the communities that make up this growing force of low-wage workers — to allow light through to expose capitalism as a system that is unwilling to provide even the most basic necessities of life and is motivated only by profit through exploitation, police brutality as in Ferguson, East LA, Harlem, South Central. And once we bust through, baby, things ain’t never gonna be the same again. Part of the inspiration for this ballot comes from the struggle by the Civil Rights Movement that included Dr. King’s Poor People’s Campaign. Dr. King wanted to raise the minimum wage to $2, that would come to $15.57 today. I would like to propose that we build upon that during the King celebration in LA in January, where 100,000 people will be marching to honor Dr. King. There are 4 million people in the city of LA. If we start an appeal to win $15 an hour and the building of a workers’ assembly, that would put workers’ issues at the forefront in LA. If we reach out to every neighborhood block club in South Central and East LA, every church, college campus and high school, and make this campaign viral with the help of our allies and rank-and-file union members and social media, can’t we get just 1,000 people to come to the King march and spend just a few hours getting 100 signatures each? I think we can, and our Party can help make that happen. 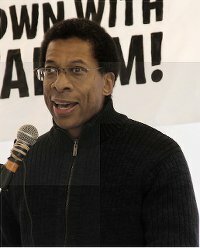 Let’s give it a shot — and even if we miss our target by a little, imagine how spooked we will have made the powers that be and how credible, attractive and established the LA Workers’ Assembly will appear to low-wage workers and our class in general and how much more capable we will be in fighting the state’s economic and military police wars against our communities.